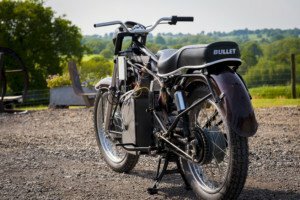 All-electric Enfield — the first ride! - Vintage Tyres All-electric Enfield — the first ride! 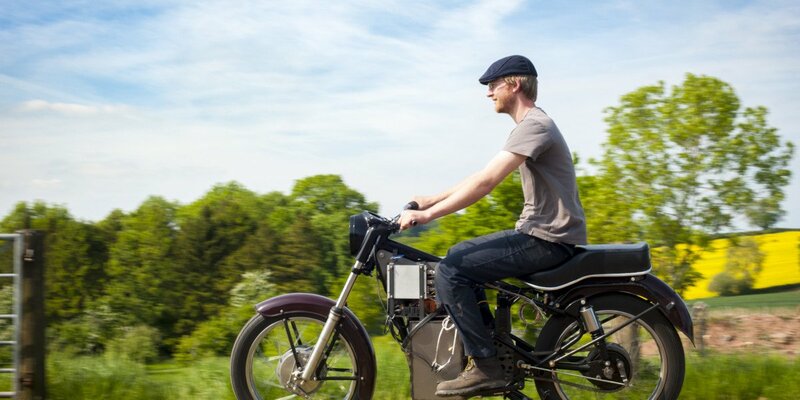 All-electric Enfield — the first ride! Engineer, Fred Spaven is building an all-electric Enfield Bullet to take on the classic Land’s End to John o’ Groats challenge. A lot has happened at Spaven Engineering in the last few months. The Charging Bullet has progressed from a collection of parts to something vaguely resembling a motorcycle. The plan to convert an old 350cc Enfield Bullet to pure electric power and ride it from Land’s End to John O’Groat’s is coming together, slowly but surely. Since we last spoke to Fred, he has finished welding up the main component; the subframe which bolts to the original Enfield engine mounts to hold the motor, batteries and all the electrical gubbins. 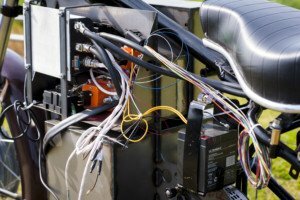 This has now been mounted in the 1961 Enfield Bullet Frame, the motor and a small, tester battery pack was installed before wiring could begin and tangles of multi-coloured spaghetti began pouring from the bike. Finally, with the bike up on stands to keep the rear wheel off the ground the ‘ignition’ switch was flicked. The battery management system (BMS) went through it’s obligatory cell checks before turning on the main contactor (a giant relay) a half a second later. This satisfying clunk signalled that the battery power was ready to be unleashed and a gentle twist of the grip sent a swarm of electrons down the hefty 350 amp cable to the motor. With the bike still largely unpainted and still lacking (among quite a few other things) a front brake, it was time to wheel it outside for a spin around the yard. The best way to describe the ride is: easy, the Enfield’s laid back handling works perfectly with the zero fuss electric d rive. The clutchless operation doesn’t take much getting used to but I did keep feeling my toes reach for a gear lever that isn’t there! Handling was excellent and, at least up to 25mph or so in the yard, the bike felt stable and controllable just as it should. Of course brand new bearings, tyres, forks etc. help enormously and everything felt tight and new making for a very confident ride. It’s never going to win races but the easy going feel and lack of fuss make the bullet a really user friendly machine and it should fit the bill as a daily commute down country lanes or city streets. The bike is far from finished, however, and Fred’s still got a lot to do before the big Land’s End to John O’Groat’s run later in the year, from fabricating covers that will keep the Scottish rain away from the batteries to fitting the instruments: a speedo and state-of-charge meter, effectively the electronic ‘fuel’ gauge.